On August 23, 1946, Southern Pacific 2-8-0 no. 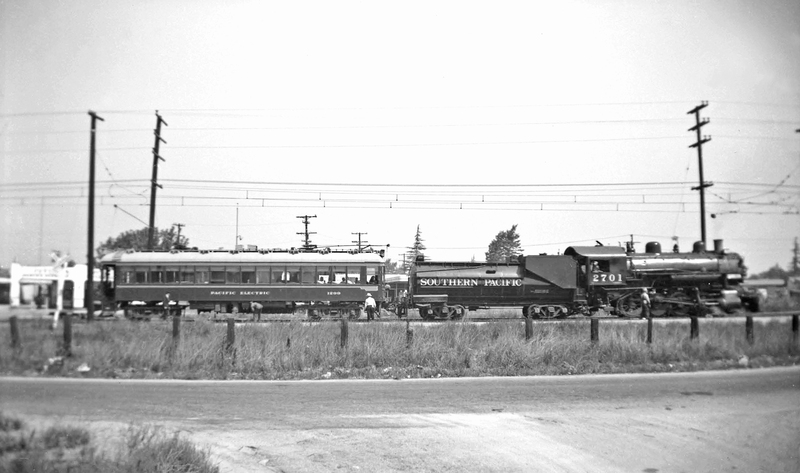 2701 is preparing to depart Baldwin Park eastward over the SP’s Covina Branch with Pacific Electric office car no. 1299 in tow. The PE would purchase that portion of SP’s branch between Bassett, on the Sunset Route main track, and Ganesha Junction, a short distance from Pomona, on September 1, 1946 a mere 9 days later. This trip was one that PE officials made over the line to see firsthand what their $400,000 investment looked like. 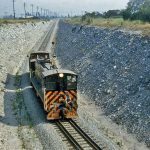 The SP’s trackage between the Reliance Rock Spur, just east of Baldwin Park and Lone Hill was not electrified at this time. 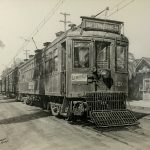 That would come in the next two months as PE sought a route that avoided increasing automobile congestion on their original line along Badillo Street in Covina. Here we see some last-minute mechanical goings-on beneath 1299 as overseen by Road Foreman of Engines Baker. Engineer W.H. (Windy) Owen is keeping an eye on things while the fireman has a last look around. Amazing image! I can’t recall ever seeing a photo of 1299 behind a steam locomotive! A unique view indeed! During the 1950s, 1299 was pulled by SP diesels on a number of occasions. My mother took a movie of 1299 going through Arcadia on the Duarte Branch/Day and Night Spur around 1958, powered by a 4600-class diesel. I have a photo of 1299 coupled to SP 1474 (Alco S-4 in the tiger stripes color scheme) at Orange Empire, and as far as I know, there’s no reason why Ventura County 2 (Baldwin 2-6-2) couldn’t pull 1299 during a special event. Regarding “Windy” Owen: He was a conductor on the Mount Lowe Ry. (PE Alpine Divn.) in the 1930s, and as I recall, he had a printed copy of the “spiel” used by conductors between Echo Mtn. and Ye Alpine Tavern. He was also an Amateur Radio (Ham) operator in his spare time.